There is a commonly cited problem with EVE: that all decisions are made in “smoke-filled rooms” between the same 10-15 people and no new players can enter into that arena. Have you ever considered why? Before we’d continue, I’d like to point out that the above isn’t true. Every single player has chance to get into practically every alliance/coalition if he is persistent enough and by being there, increasing the options of the alliance leadership. If suddenly 10000 people would recognize that his true home is SOLAR fleet or Spacemonkeys Alliance, the map would change radically. But there is a layer of truth in it. You won’t be the next The Mittani, Montolio, Vince Draken, Elo Knight or Shadoo, no matter how hard you try or how skilled you are. If we consider the infamous fails of some of them, it is surprising. I recognized the problem when I’ve read about the alt-gate. The answer “why can’t you get into the smoke filled room” is the same as “why can’t you be the next Chribba”. I’ve been playing EVE for almost two years. I’ve never ever scammed anyone. I am pretty upfront in what I believe, no matter what others think. Yet I couldn’t start a supercap escrow service, even if I’d have much lower rates than Chribba. The answer is “trust”. It’s not mathematically quantifiable. My scam rate is the same 0% as it’s for Chribba. Yet no one would believe me. Or more correctly no one would give me a chance. Why? Because Chribba is already there and he has proven himself. He took the position of “trustable guy” and until he leaves it, there is no other spot. It’s similar to being married. As long as you are OK in your marriage, you don’t even consider if others would be better and your wife could be replaced with gain. It only happens if your marriage is awful. It doesn’t matter how hard Vince failed with the Falcon and how hard Elo failed when a total stranger sent him a screenshot of a PL titan with “PL Spy” literally written on it. It doesn’t matter that in these situations a 4x Civilian shield booster fit Mackinaw miner would have made a better choice. Unless they do something that makes them totally inacceptable, they stay, because they have already proven their loyalty to their group. They will not awox or steal. They earned the trust and no one gets a chance until they remove themselves from their position. It’s not the same in the real world business. You don’t stick to the same shop until it closes or starting to sell absolutely inacceptable products. You try out other shops when they are nearby or if they have a sale. You try out new video games even when you are satisfied with your current one. The reason is that the society enforces a level of trustworthiness on everyone. The other shop I try might have rude employees and low quality wares. But it is surely not like the shop in the Pulp Fiction where people are kidnapped into Zed’s torture chamber. They also won’t rob me and even if they sell me faulty products, I will be able to get a refund from them, because the law says so. The other video game might be lame, but surely doesn’t contain spyware. A level of decency is guaranteed, therefore I can safely try out others. In EVE, it’s not true. Sure, X might show better judgment than Vince in the Falcon issue. But X might also be a Goon spy and Vince is surely not. X might lead our whole super fleet purposefully into a trap, while Elo only does it when he fails. X might rob anything and everything I had in the game, publish my chat logs, mails, lingerie pictures I carelessly sent him and my IP address and e-mail from the mumble server allowing people to find me in real life. There is no limit how much damage X can do to me in the game and the only thing I can do to prevent it is not trusting anyone who isn’t totally trustable, no matter how incompetent and annoying he is. Vince, Elo, Mittani and co have proven themselves in this aspect towards their group and no one in his right mind would risk a change. If you want EVE to be somewhat social game, you need to establish some basic level of trustworthiness. I do not want (and due to alts cannot) remove spying. But the list of things needed to prevent a single guy destroying everything that thousands have built are bare minimum to make EVE grow. Until it is implemented, the only real option besides the three above is what I’m building now: a loose cooperation of solo players who share a common goal, share information but don’t share their assets and don’t follow orders. You could absolutely be a super escrow service. Absolutely. 3) you slowly, but ever so surely build trust to the point where you can say "you know, i could offer cheaper rates if we ditched this chriba guarantee"..
No offense Gevlon, but which group(s) do you think you're ganking? You're not going after the monkeys, you're not wasting your time on small ships - you're preying on the players that have had no recourse but to fly solo. They can't venture into low-sec because they're basically DOA, so that pretty much limits their options. Actually, no 3rd party is ever likely to do that, since that ties you to the. Once you build up your trust and get your guarantee back, if you scam, it hurts them too much. But Gevlon, you are wrong. Firstly, you are wrong that you can;t be a Chribba. There's more than one 3rd party service used for titans, in fact I can think of 3. The problem is not that you can't become one, it;s that you can't become one overnight. It takes years of building up from small scale third party stuff to get to the big leagues, and you need to run other services alongside it. Chribba runs multiple community websites and has been providing a 3rd party service for years. When I joined EVE, he was not the beacon of trust that he is now. That's taken years of dedication to build up. 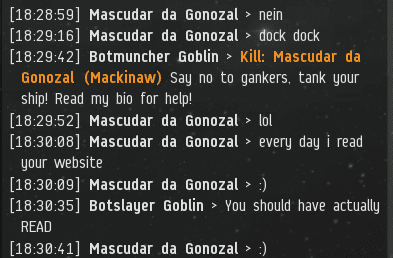 Oh, and nobody trusts someone who chooses to gank in high sec. Sorry bud, but to most people that goes hand in hand with scamming. Secondly, there's nothing wrong with in game groups. Those F1 monkeys you talk about, a lot of them are great guys, and there's a lot more to do that just F1. You had bad experiences with TEST, I know, but not all alliances are like that. There are roles and responsibilities internally to alliances that you can take up. Really, it's easy to jump on the "alliances are F1 pushing monkeys and nothing more" bandwagon, but really for most people alliances are great fun. The problem is, you are a bottom line guy, and you have no interest in people. 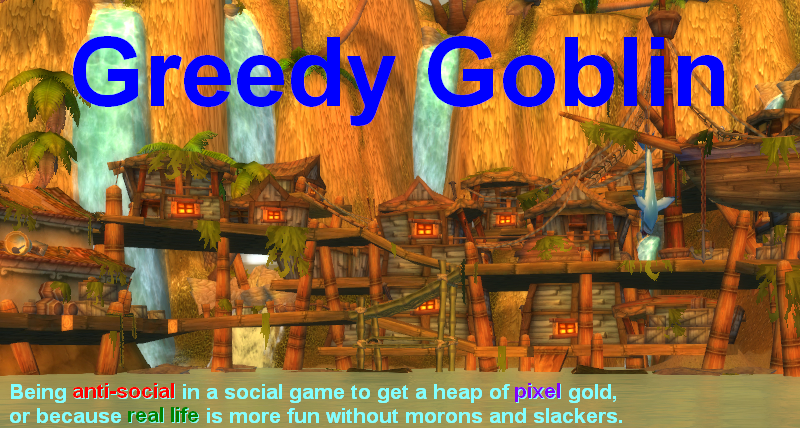 So you will never find your place in an MMO. The only place you could ever feel you like is at the top where you can command people and noone can tell you otherwise, but the problem is you can't get there without going through the rest of the ladder first, which you refuse to do, and being a leader takes great social skills and realistic ideology, neither of which you have. Anon, Chribba refuses to enter into those arrangements because he refuses to secure transactions he is not directly involved in. So nope. Gevlon, new people become third parties all the time and almost all of them take a few hundred bil before people stop trusting them. Stop assuming and actually check the forums. Trust in Eve is different, I've always found the "full API" key requirement a big drawback when looking to join in on corp/alliance's. It's like being asked to bear all in a crowded room full of strangers. The way you are thinking about this leads you to wrong conclusions. First, your focus on trust seems wrong to me. You should know from your TEST experience that trust is handed out freely in most alliances - advertise a new jumpfreighter service and people will trust you with tens of billions within days. However, trust usually doesn't get you anywhere within your alliance's career ladder - initiative and activity do. Mid-level leadership burns out constantly which opens up positions which players who have shown activity can succeed into. The step from mid to top level is not guaranteed but if you stick around long enough (read a year or two) and maintain your level of activity it will eventually happen. Activity trumps competence (and trust) every time - there are many highly competent EVE players in any large alliance but very few of them can spend 80h/week on EVE for several months without burning out. Players like dabigredboat (whose level of competence borders on incompetent in most areas) are invaluable and will be preferred over much more qualified contenders simply because of their level of activity. Second, the fastest/easiest way to get into smoke-filled room is not to work your way up within your alliance but to be involved in the formation of a new alliance. TRIBE's triget is a great example for a player who went from nothing to leader of a major alliance in a meteor-like rise (and then back to nothing again). A lot of stars had to align the right way for this to happen and triget's natural Machiavellian instinct was certainly a prerequisite, but this kind of career is almost impossible in established alliances. There is a difference between gaining a position of power and gaining public trust. A top power position, by its nature, can only be one man. There cannot be N heads of Goonswarm (for N > 1) because as a governance structure, committees do not work. Whereas there can be N highly trusted individuals doing supercap escrow. As you say, you cannot become the next leader of Goonswarm. The position is filled and the Mittani is good enough. However you can gain public trust, and that may be sufficient to get into the escrow business. Indeed there are many existing businesses which do escrow in New Eden. I bought my current wormhole via Taggart. The job is far too large for just Chribba. @Anonymous: yes, dumb people trust blues blindly and always pay for it. I know I could be a scammer. But I couldn't be a leader, nor could anyone else because not dumb people won't risk trusting me while they have their old workhorse, no matter how bad he is. I think you are confusing two aspects of "trust". There is trusting someone not to scam you and there is trusting someone to be a leader. Issues of trust are always going to plague EVE but you have to differentiate between trusting someone with in-game cash and trusting someone with a leadership position. That said I would love for EVE to have real 'trust controls' built-in since for me it their lack wrecks the cooperative nature of a sandbox MMORPG. Grendell, Darknesss, Vaerah Varokh are among some widely trusted players, there are also even more who on name alone can publically procure tens of billions in an uncollateralized loan. Then there's the people who pop out of the blue claiming to be third parties and some even end up managing to scam SCs or Titans. I'm guessing you simply haven't tried. 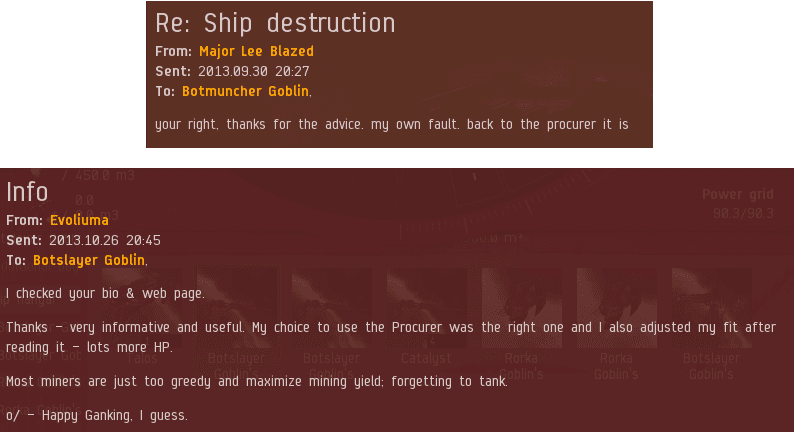 Your options in EVE - You reap what you sow. Finally you have come around to what a lot of lurkers know. Gevlon does not want social interaction, he wants to set parameters for success and then win on those lines. Thats fine, we all play for different reasons. But he will never understand the group of guys who have known each other for 10 years playing different games together and spending the majority of their time talking over VOIP about their RL. This is an alien concept to Gevlon and cannot be min/maxed so is therefore pointless. But fun to watch him stir up the paradigm's in different games as he goes. Sometimes he breaks them, other times they are actually true. Other than that I lurk to watch commenters get frustrated when their set win perceptions are challenged.